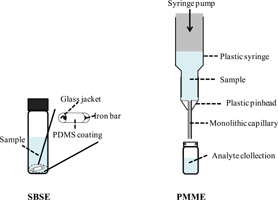 In this review, the application of Solid-Phase Extraction (SPE) and Solid-Phase Microextraction (SPME) for cosmetic analysis is discussed. European official methods for cosmetic analysis are taken as a starting point for appraising the introduction of SPE and SPME in this area. The advantages of these sample preparation techniques over other extraction techniques such as liquid-liquid extraction for cosmetic analysis are also pointed out. A complete revision of the literature during 1992-2013 is provided. The automation of SPE, the different modes of SPME used for cosmetic analysis (direct-SPME, headspace-SPME, stir bar sorptive extraction and polymer monolith microextraction) and the use of new solid phases for different analytes are highlighted. The problems caused by the nature of cosmetic matrix are considered, especially the difficulties for adapting directly SPE and SPME procedures to this kind of samples.